Posted by Jay McDouall on Tuesday, July 17th, 2018 at 3:36pm. And yes, six months may seem like forever, but keep in mind that you should still be able to access most of your kitchen for the majority of this period, so you won't be subsisting on Pop-Tarts. Still, this duration is worth factoring in just in case you're chomping at the bit for your new cabinets and countertops to look picture-perfect just in time to, say, host Thanksgiving dinner next year. Still, typically when homeowners wonder how long a kitchen renovation will take, they're worried about that awkward, deprived phase when they can't easily use their stove, fridge, and countertops at all. The answer here is more merciful, but it's still a long slog, particularly if you're a foodie who gets sick of takeout fast. "I like to tell clients to expect to be without their kitchens for an average of six weeks," says interior designer Tina Ramchandani. Why, exactly, do kitchen renovations drag on for so dang long? Because they're the perfect storm of renovation-related time delays all rolled into one. For starters, kitchens are custom. Every kitchen is different, in terms of size, shape, even down to whether you want brass or brushed-nickel hardware on your cabinets. And such personalized projects require a lot of human input—in fact, an entire team may be weighing in. Ever heard the phrase "too many cooks in the kitchen"? That describes kitchen renovations to a tee—there are just a whole lot of moving parts! Further complicating matters is that many of the materials used to build a kitchen are huge, and heavy, and take time to ship. What's more, everything must be installed in your kitchen in a certain order—cabinets before countertops, for instance—so if you're dying for a particular Carrara slab but forgot to order it in advance, waiting on this shipment can waylay your project tremendously. You can also expect a bunch of hurry-up-and-wait scenarios when it comes to procuring permits for your renovation (which are required by law, so don't cut corners). And if your demo has sawdust flying through the air, it's downright dangerous to light a gas stove, so better safe than sorry there. Last but not least, never underestimate the paralysis that can set in when you have to choose exactly which faucet, finish, or features you'll have to live with for the next umpteen years. Weeks can flash by as you hem and haw. And once contractors start hammering, last-minute changes can press rewind and add days or even weeks. 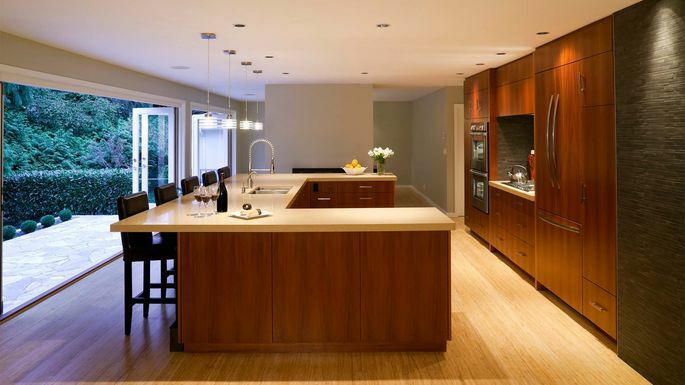 The secret to keeping your kitchen renovation as short as possible is simple: Plan ahead, and try to avoid changing your mind midstream. Plus, while your kitchen renovation may cramp your usual cooking methods, you don't have to suffer. It's also the perfect excuse to break out of any ruts and experiment with more offbeat ways to eat well by leaning on other items you may overlook: an outdoor grill (who said you can't grill in winter? ), slow cooker (just plug it in), raw food recipes, and (for when you're fridge-less) an ice cooler for staples like milk, eggs, and deli meat. Trust us, this is a first-world problem that you will totally survive, folks. So try to see this limbo period as a necessary hiatus that will make you appreciate your new kitchen all the more once it's done.